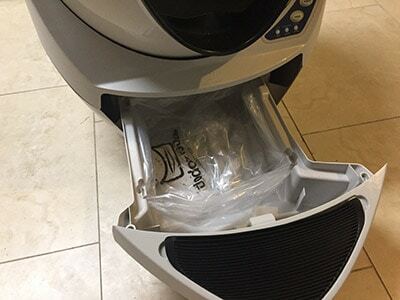 Don’t buy this item before you read a review from someone who actually purchased and used Litter Robot. Just imagine…never cleaning your cat’s litter box again. EVER. If that sounds like a lovely thought, then the Litter Robot Open Air III may be just what the doctored ordered. A high-quality automatic cat box that’s built well and doesn’t require too much maintenance, this model fills all the needs of the busy cat owner looking to reduce chores. The litter box is ideal for cats of all sizes and multi-cat households. Your cat will be able to use the bathroom in this box, and you’ll never have to see the waste. Plus, the box uses a unique globe feature that is almost silent while operating. One thing many users love is that the box comes fully assembled. There’s no messing around with this model. Did our cat Fozzie like it? Let’s find out…. As our top rated self-cleaning cat litter box on the market, the Open Air is chalk full of great features. People love this box and for a good reason. This litter box does its job really, really well. If you’re looking for an automatic cat litter box that just works, then the Open Air is for you. Everything in this box is automatic. When you cat steps in the Open Air III, there’s a sensor that automatically stops any cleaning and lets your cat take care of business. Once you cat exits, the box automatically begins cleaning again. Then the waste is automatically disposed of in a storage area. Many automatic litter boxes do a good job. There’s only one problem: they aren’t made for cats of all sizes and certainly cannot handle multi-cat households. 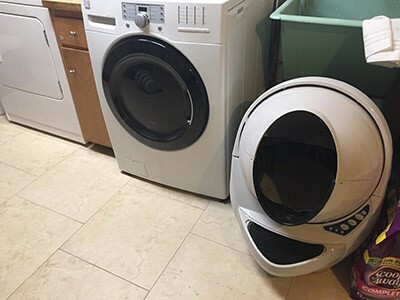 The Litter Robot changed all that. Not only does it do its job well, but the unit is designed for large breed cats and multi-cat households. This thing can take anything your furry friends can throw its way. Well, it’s more like no setup at all. This unit comes fully assembled. You legitimately take the thing out of the box and plug it in. Your cats can now use the litter box without worry. It really doesn’t get easier from a setup standpoint than this. My personal favorite thing about the Litter Robot Open Air III is the once a week maintenance I have to do. Once a week, I have to open the secluded waste container and switch the bags. Then I take the bag into the garage and throw it away. The whole process takes two minutes. Then I’m done dealing with the litter box for another seven days. It’s that EASY. There’s no changing of litter require or anything. I was a bit skeptical that my furry friends would like this unit. 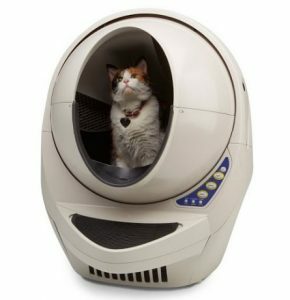 The design is entirely different, and I was concerned I’d have to train my cats to actually use this automatic litter box. That all changed the second day the device was in my house. My cats immediately adapted to this unit and started using it. They loved it from the outset and we haven’t had any issues adjusting at all. 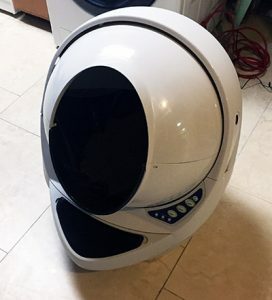 The Litter-Robot III features dimensions of 29.5″H x 24.1″W x 26.1″D. The oval entry offers dimensions of 15.5″H x 10.25″W. The litter area is 14″ x 14″. The unit weighs 24 lbs. In the picture below you can see it aside our washing machine. As you can see it’s quite big. We’ve tested a lot of litter boxes over the last couple years. None of them are perfect. Each device has its own unique set of issues and problems. 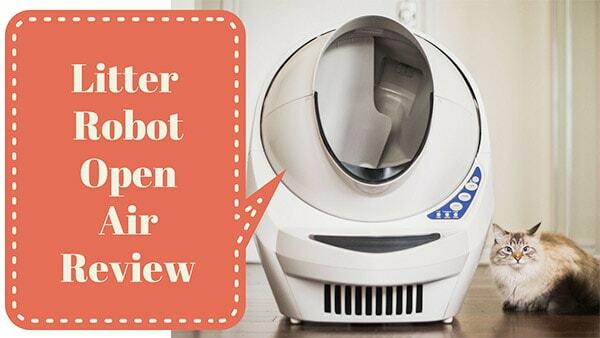 However, we’ve found that the Litter Robot Open Air III is the best automatic cat litter box on the market. Bar none! This litter box just works. Everything the manufacturer says this box can do, it does well. 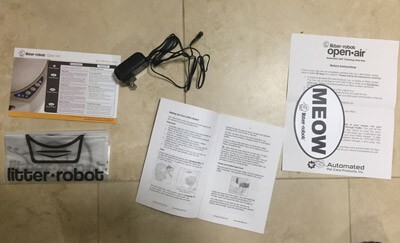 If you’re looking to avoid contact with cat waste as much as possible, then this is the box for you. Not only will it save your from nasty smells, but you’ll also not have to waste any time changing the litter box. It’s truly a win-win for cat owners!